Since land turtles and aquatic turtles are both popular in the pet trade, it's important to know which category your turtles fit into so that you can mimic their natural environment as closely as possible with the habitat that you set up for them. 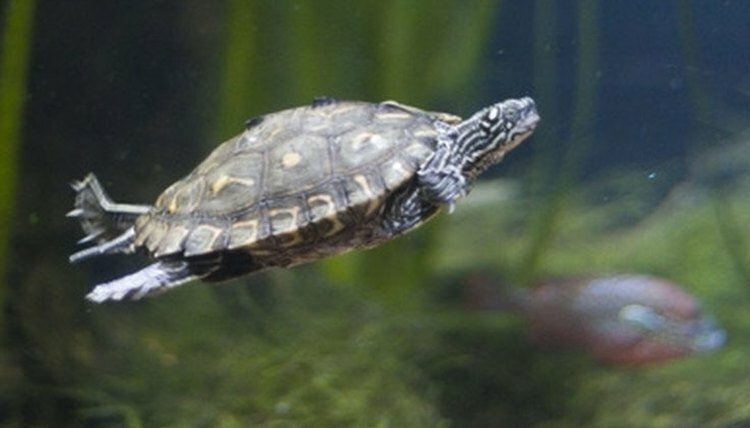 Land turtles, usually referred to as tortoises, need only enough water to submerge herself and soak her shell, whereas aquatic turtles (or sea turtles) need ample swimming room. Sea turtles live about 70 years, while land tortoises can live up to 150 years. A turtle's most prominent feature is her shell. Many water-dwelling species of turtles have evolved to be better swimmers and they exhibit evolutionary characteristics through their shell. If it's leathery rather than the more common bony shell that most turtles have, you have an aquatic turtle, though not all aquatic turtles have soft shells. Most aquatic turtles, even those with harder, bony shells, have a more streamlined profile. Their shells are not as high as those of their land-bound brethren -- aquatics are much longer than they are tall. The most common land turtle in the pet trade is the box turtle. Not only is her shell taller than that of most aquatic turtles, but herplastron -- the belly-side of the shell -- is also partially movable at the front and back, as if it were hinged. Unlike aquatic turtles that escape predators by fleeing into water, the box turtle doesn't swim well, but she can completely close herself up in her shell, protecting her legs, head and tail. Most turtles are somewhat aquatic; however, strictly land-dwelling turtles live in semi-desert or grassland areas with rough terrain or ground. Land tortoises flourish in temperatures ranging from 75 to 85 degrees Fahrenheit but live all over the world. Sea turtles can be found in a variety of water habitats including estuaries, lagoons, bays, seas, and shallow coastal regions. Much like land turtles, sea turtles can be found worldwide in climates that are temperate and warm. Neither land nor sea turtles have teeth, but their jaws are strong and hard. Jaw shape and size are determined by the species of turtle. A turtle's diet can be determined by the shape of the jaw. Land turtles are usually omnivores, which means they will eat both meat and plants. Sea turtles can be omnivores, carnivores, or herbivores depending on their species. Young or newborn sea turtles are omnivores that will eat plants and very small water creatures. By adulthood, most sea turtles switch to a diet of vegetation only. Breeding for land turtles and sea turtles is virtually the same, the only difference being that land turtles mate on land and sea turtles mate in the water. During mating season, or spring, the male turtle mounts the female. Fertilization takes place inside the female turtle. Both land and sea turtles make a pit in a warm, sandy area for their eggs. This is the only time sea turtles ever come ashore. After the eggs are laid and the nest is covered, it takes about 60 to 90 days before the eggs hatch.